FORTUNE -- New GM CEO Dan Akerson has been out beating the drum for the Chevrolet Volt lately, looking for ways to double or triple production, placing want ads for 1,000 more engineers to work on electric vehicles, and talking up plans to begin exports of the Volt. Akerson is new to the auto business, so he can be excused for not being up to date on his industry history. But he may want to start a deep dive into GM's (GM) corporate archives, as well as ordering up a little competitive analysis on an ancient rival -- Toyota (TM) -- before he says any more. A remarkable story in the Detroit News on the birth of the Chevrolet Volt exposes the kind of thinking that led the old General Motors into bankruptcy -- and illustrates perils that await the new GM if it slips into the same bad old ways. It depicts a company so preoccupied with its public image that it tended to overlook what was best for its customers and the environment. It also positions the Volt as a technological outlier, a car built for an agenda that differs significantly from those of its competitors. GM pioneered the development of electric cars 20 years ago, but the EV1 was an economic failure; it was discontinued in 1999 at a cost of $1 billion. So GM's ego was bruised when Toyota brought out the less ambitious but more commercial Prius, a gas-electric hybrid, in 1999 and made it a huge public relations success. "I was getting sick of it," vice chairman Bob Lutz said to the Detroit News. Under growing pressure to find environmental solutions and with its status as a technology leader in jeopardy, GM started work on a second-generation, high-mileage, low-emission vehicle. But, as the Detroit News article reveals, GM was not so much interested in exploring new technology as it was in ensuring that it wasn't going in the same direction as Toyota. Building a better hybrid, for instance, was considered unthinkable. At the same time, GM's generals were fighting the last war. They were preoccupied with the problem of "range anxiety," the worries about the short range of battery cars that helped sink the EV1. So when Lutz suggested developing another electric car using new generation lithium-ion batteries, according to the News, he was shot down by CEO Rick Wagoner. "We lost $1 billion on the last e-car we did," Wagoner told Lutz. "Do you really want to do this again?" Unwilling to play second fiddle to Toyota, yet afraid of doubling down on electric cars, GM came up with a compromise solution: the Volt, which runs on batteries for 40 miles or so, and then switches over to gasoline power. The batteries can be recharged overnight by plugging into a household current for another 40-mile electric run the next day. 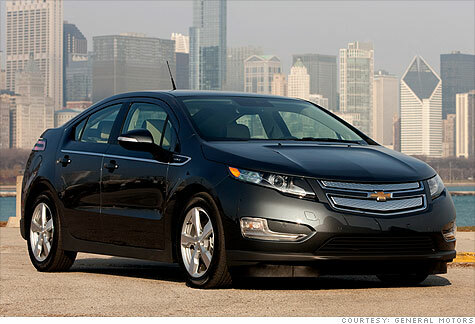 By standard industry definition, the Volt is a plug-in hybrid. But to avoid being associated with anything Toyota, GM came up with the awkward descriptive phrase "range-extended electric vehicle." As a piece of engineering, the Volt is elegant. It drives smoothly under electric power, and when the batteries run down and the changeover is made to the gasoline engine, the transition is imperceptible. But all that technology and 40-mile EV range comes at cost: the Volt carries a sticker price of $41,000. That high price could seriously limit Volt's future progress. Like GM, Toyota decided to get into battery power in the early 1990s, but it followed a different road. Without any competitors to worry about, it set its own target: improve existing mileage standards by 50% (later raised to 100%). When it became clear that improvements in existing internal combustion engines wouldn't enable it to meet those targets, it turned to hybrid gas-electric. And when Toyota needed to raise the bar even further in the 2000s, it decided to stick with hybrid gas-electric instead of starting from scratch with a new architecture as GM did. So by simply adding more batteries to the Prius, it created the plug-in Prius. Production begins in 2011. The plug-in Prius is designed to run 15 miles on electric power alone, just a third of the Volt's EV range. But the plug-in Prius should be easier to engineer because it is built on Toyota's existing hybrid platform. Since the gasoline engine is always engaged with the powertrain, the plug-in won't need all that expensive software to manage the transition from electric. Most importantly, the plug-in Prius will require many fewer batteries. According to a report published by the National Research Council which operates under a charter from the U.S. Congress, the battery pack for the plug-in Prius is estimated to cost about $3,300, In the first generation of production. The battery pack for the Volt, by comparison, is estimated to cost about $14,000. That's a steep price. In effect, Volt drivers are paying more than $10,000 for an extra 30 miles of EV range. "Battery technology has been developing rapidly, but steep declines in cost do not appear likely over the next couple of decades because lithium-ion batteries are already produced in large quantities for cell phones and laptop computers," the Council says. So Akerson should enjoy his moment in the sun. Nobody is expecting Volt to suffer the fate of the EV1, but its high price and one-off technology mean its success isn't the slam-dunk that its supporters would have you believe.